Reenie's Book Blog: Unauthorized Access 2.0 ~ Event! Interview! Giveaway! Unauthorized Access 2.0 ~ Event! Interview! Giveaway! When you believe in a book and an author so much, what do you do? Yes, I have talked about 'Unauthorized Access' before, twice actually (but who's counting) however.. I have some exciting and fun stuff to share!!! If you have no idea about this novel I have declared 'Phenomenal' than please click this link to read my original blog review! 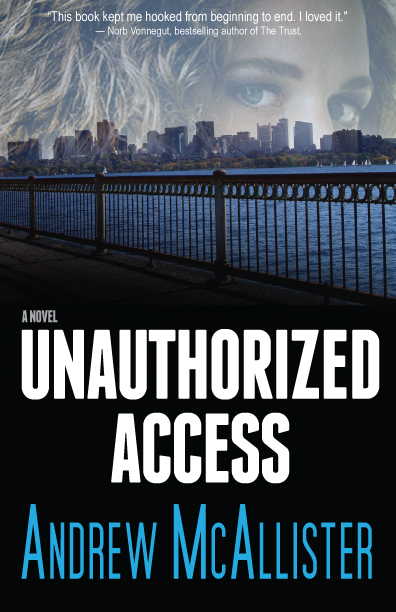 Besides it being a MUST HAVE for your book collection, Unauthorized Access is celebrating a brand new cover!! On March 6th thru to March 8th Unauthorized Access will be FREE for Kindle on Amazon.com!!! If you are on FACEBOOK than please RSVP to the event using this link!! I recently interviewed Andrew McAllister where he discusses everything from the new cover, to how he got started writing. Even sharing his dream cast if Unauthorized Access were to become a movie! Moi: What made you decide to give the book a fresh new look? Who designed the cover? Moi: What was the process like? Andrew McAllister: The process was amazingly interactive, despite the fact that I live 3,000 miles from San Diego. First we brainstormed a few general concepts that we thought might work on the cover, basically drawing from scenes in the book. We thought of a young woman running through the woods at night, for instance. We finally settled on an urban look because that matches the story. Then Tom Matthews worked up several concept covers, using different images, color schemes, layouts, typefaces, and so on. We settled on the one we liked the best and then had a series of interactive work sessions. That was a blast! Through the magic of Skype and email we were able to work as if we were in the same room. We fiddled and tweaked the details until the result satisfied both of us. The process took a few weeks but I feel like the result is well worth it! Moi: Do you have any other novels or plans for one in the works? Moi: What inspired the novel Unauthorized Access? Andrew McAllister: Some number of years ago the itch to write a novel became so great that I couldn’t possibly ignore it, so I started spending my idle moments wondering about story ideas. Besides being a writer, I am also a computer scientist, so I had a vague idea that the story should have an Information Technology angle. They say to write what you know, right? Then one day I was listening to an interview with an Internet security expert on public radio. “Can you imagine what would happen,” he said, “if someone managed to take down the systems at a bank?” His remark got me imagining exactly that scenario, and Unauthorized Access was born. Moi: When did you begin writing? Andrew McAllister: For me, writing began as a natural spinoff of reading. I was a voracious reader growing up, and I still am. The idea of writing didn’t occur to me, however, until I was an adult. Then one day the idea just strolled fully formed into my brain. “You’d like to be a novelist,” the idea informed me. I agreed, and we’ve been partners ever since. I started the way most writers do, with short stories, writing contests, and writing classes. I’m still quite fond of the short-short story that was a contest winner with Alfred Hitchcock’s Mystery Magazine. Moi: You are an avid reader. Can you share your biggest literary influences? Andrew McAllister: I’m an omnivore when it comes to books. I’ll read just about anything if it has conflict and can hook me enough to keep turning the pages. I have to admit, though, that my fave reads are action and suspense. I love World War II history, so authors like Alistair MacLean, Jack Higgins, and Ken Follett are naturals for me. In fact, an audio book version of Follett’s The Key to Rebecca is currently plugged into my car stereo. Other notable reads that come to mind are Jaws by Peter Benchley (which I read in a single sitting), The Godfather by Mario Puzo, and everything by Stephen King. The Stand is my favorite book of all time. The bulk of my reading over the years, however, and the greatest influence on my writing has been the work of thriller writers like John Grisham, Lee Child, David Baldacci, and Christopher Reich, to name just a few. I love it when characters are thrown into terrible messes and must scratch and claw their way back some semblance of normality. Moi: You have had so many wonderful 5 star reviews. Can you describe that moment when you read the first one? Andrew McAllister: You know, if there is one aspect of the published novelist experience that has surprised me the most, it might be online reviews. Some of my expectations turned out to be true, for instance that reviews have become an important “currency” by which an ebook is judged while someone is considering whether to read it. My first 5 star review followed an email I received from a young Canadian college student who was traveling in Europe last summer. She downloaded Unauthorized Access onto her Kindle on a recommendation from one of her girlfriends. She ended up reading the entire book in a single sitting while on a long train ride. It was a delightful feeling to have that email pop up in my inbox. In some sense this type of feedback is a validation of years worth of effort. Moi: Are there any genre’s you enjoy that people might be surprised about? Andrew McAllister: Like I said, I’ll read anything that holds my interest, but it’s usually more about the individual book than the genre. I’ve never been much into romance books, but I recently read On The Island by Tracey Garvis-Graves. It was wonderful! The first night I started reading it I was up half the night. In this case the cliché was true – I couldn’t put it down. I also truly enjoyed The Notebook by Nicholas Sparks. I’m not sure if reading two books is enough to classify me as a romance-aholic, but I can certainly appreciate some books in the genre. Moi: As I mentioned in my blog, I could picture Unauthorized Access as a Hollywood Blockbuster. If that were to happen, who could you see in the lead roles?? Cast your movie!! Andrew McAllister: It makes me happy that you’re not the only person who has suggested the idea of a movie. Of course that’s the kind of validation only a few authors ever get to enjoy. It’s fun to dream, though, so here goes. I should start with Rob and Lesley, the young couple who are also the two main protagonists. I’ve described Rob as having dark, spiky hair, so I thought someone like Josh Hutcherson would look the part. For Lesley I chose Odette Annable. What a handsome couple! Do they look like they belong together or what? Then there’s the ultimate menacing bad guy, Ray Landry, who also has a cultured side. One look at Jason Statham’s face and you know he could pull off that role! Open to residents of Canada & the United States. You can enter one of two ways!! Email me your name, age and province/state at reeniediva@gmail.com to enter OR visit my Facebook Page and send me a message with the same information. Contest Closes March 9th at 7pm EST. I'm a stay at home mom, and have been for the better part of 9 years.I've been a bookworm since birth (yup, totally read in the womb) and have so many books I could open my own library. I read almost anything which is why I started this blog. Be Sure To Tell Your Friends To Stop By!